Bobcat Australia introduces the newest additions to its existing line of attachments, the Bobcat SG30 and SG60 stump grinders. Both models of stump grinder are now available. The SG30 stump grinder attachment is suitable for use on the MT50 mini track loader, 463 and 553 skid-steer loaders; while the SG60 best suites the S130 through to the S300, A300 and all Bobcat track loaders. Similar to the SG60 stump grinder, the work group on the SG30 is offset to the left and slightly forward to offer excellent visibility to the stump and a fine mesh screen shields the operator from chips. The adjustable debris shield can be manually closed to keep the overall width at 914-mm, and opened during operation to accommodate the large swing arc of 90 degrees. With an overall travel length of 1000-mm, cutting height of 850-mm and a cutting depth of 274-mm the new SG30 stump grinder is ideal for backyard use and its ease of operation makes it a perfect attachment for rental fleets. The SG60 is approved for both standard and high-flow loaders, however optimum performance will be achieved with a high flow loader. Loaders with 68 lpm will work, but will operate at a lower performance level. 813-mm cutting height and a 381-mm cutting depth allows the SG60 to grind tall stumps and cut into stumps well below grade. Also 1473-mm reach means less forward movement of the loader. The unique valve design for the SG60 controls the speed of the swing circuit to prevent the cutting wheel from stalling in the cut. When the pressure in the cutter wheel's drive motor reaches a threshold level, the control valve reduces the amount of oil to the swing circuit, thus reducing the swing speed. With wheel diameters of 457-mm and 685-mm and with 16 and 32 teeth respectively both the SG30 and SG60 stump grinders are a powerful grinding attachment that make light work of tree stump removal. The SG30 has functions for swing and depth control, whereas the SG60 has functions for swing, depth control and reach. A 14-pin attachment control kit is required to operate the SG30 stump grinder attachment. Whereas the SG60 requires a 7-pin attachment control kit. 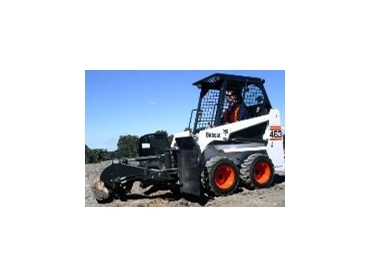 For more information on which stump grinder is best suited to your Bobcat loader or your nearest stockist contact Bobcat Australia on 1800 643 853 or visit www.bobcat.com.au.